The Stars Travel Hockey Program is designed for players who want to make a serious commitment to the game of hockey. In turn, the Stars are seriously committed to the quality of our program. With the finest coaching staff in the state, the Glenview Stars Hockey Association has been one of the most respected and successful travel hockey programs in North America. 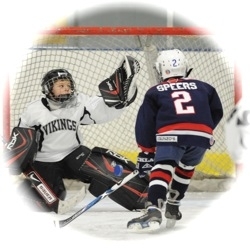 The Glenview Stars offers the opportunities for a developing hockey player to play competitive travel hockey from September through March, followed by a spring league in April and May. The Glenview Stars Hockey Association is a member of the Hockey Association of Illinois (AHAI), the governing body of Illinois amateur hockey under USA Hockey. AHAI has announced a limit on the number of games (regular, practice and tournament) allowed to be played by each team. This is an effort to increase the ratio of practices to games in order to foster player development. Note that these limits do not apply to end-of-season state and NIHL playoffs (Blackhawk Cup and Wolves Cup, respectively). During the course of a season, you can expect to have 40 or more practices, 24 league games, weekly skills clinics and the opportunity to go with your team to hockey tournaments both locally and out-of-state. All tournament participation is decided on a team-by-team basis, voted on by each team's parents. We field teams in the Northern Illinois Hockey League (NIHL) at the Bronze, Silver, Gold and Gold Elite levels. Players are selected for AA and A level teams during tryouts by team coaches.